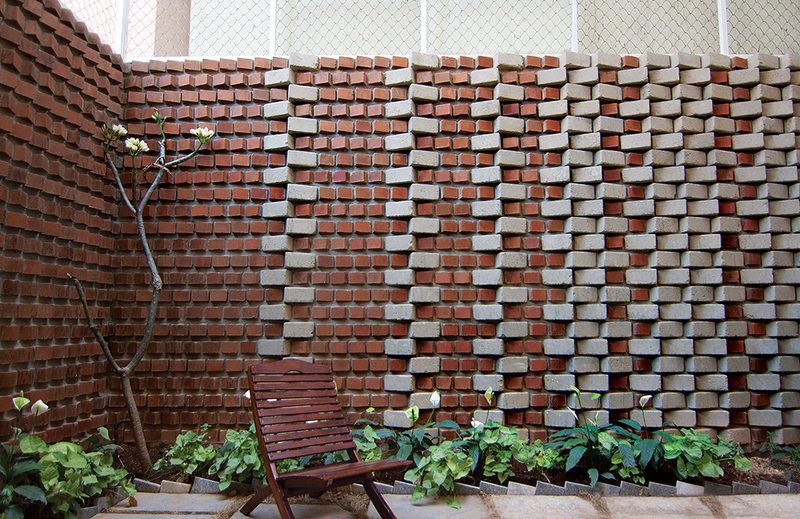 The wall surrounding Ravi and Esha Chowdhary’s backyard in Bangalore, India, includes bricks made from soil that was excavated for their home’s foundation. Architects Smruti Kamat and Lester Rozario convinced their clients to set aside a third of their lot for the garden, which draws light deep into their three-story home. To make the move count, the wall “became as important as the house itself,” Kamat says. Filled with tree-shaded lanes and flower beds, Bangalore has long been known as India’s Garden City. Two decades into the tech boom, the southern metropolis has a new nickname: the Silicon Valley of India, where glass-and-steel towers are going up as fast as old trees are coming down. Lester Rozario and Smruti Kamat, a Bangalore-based husband-and-wife architectural team, wanted to find a way to bring the green back into their city—both literally and figuratively. 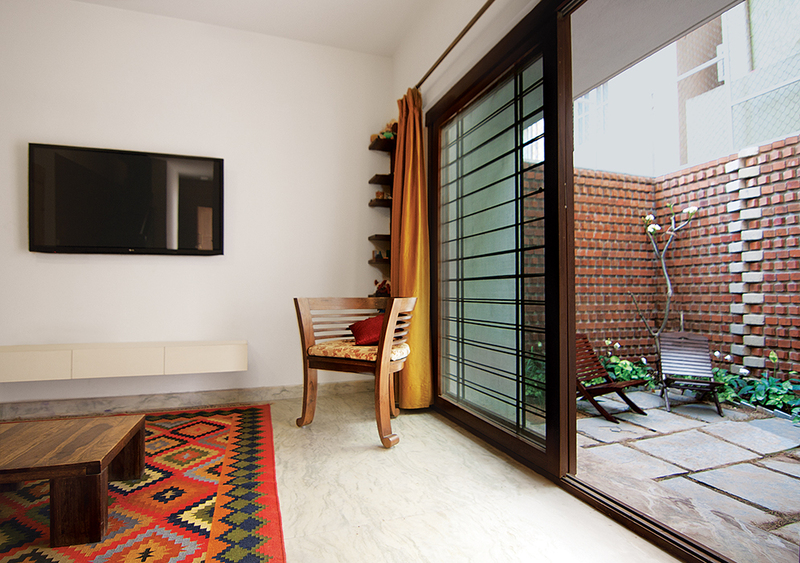 So when a young couple with a penchant for sustainable living asked them to design an urban home, Kamat and Rozario jumped at the chance. “The challenge was to find a way to seize our slice of sky,” says Kamat, who led the project. The 1,200-square-foot site was boxed in by tall buildings. At first, the architects played with standard strategies for bringing in light and air—opening up skylights, for instance, and cutting slivers into the main volume—but nothing seemed to work. Then they got bold. Carving a rectangle out of the lot’s northeastern corner, they proposed setting aside a full third of the property’s precious urban footprint for a walled garden that would function like a light well, and stacking the house in three stories on the remaining land. For the main building material, the eco-conscious Chowdharys eagerly accepted Kamat and Rozario’s suggestion of using compressed, stabilized earth blocks, which are becoming more popular in India. Soil that had been excavated to make way for the home’s foundation was mixed with a small amount of concrete and sand, then pressed into blocks at a nearby vacant lot before being cured and assembled into textured, earth-toned walls. Because the blocks didn’t need to be fired or shipped, they have a much smaller carbon footprint than standard bricks. The architects realized they would run short on earth blocks, so they began playing around with wall designs that incorporated conventional bricks. Countless brainstorming sessions later, they settled on the Fibonacci series, a classic mathematical pattern that finds expression in nature in the spiral of a pinecone or nautilus shell. Alternating russet bricks and tan blocks in a one-one-two-three-five sequence, they created a sculptural surface that can be seen through a set of glass doors from the adjacent living room, transforming the experience of being in that space. (“Full marks to the mason!” Kamat says of the complex creation.) Creeping roses, passionflowers, and arrow-leaf vines planted at the edge of the stone-paved patio climb a mesh extension above the wall to provide privacy on the upper floors and charm to the garden below. In Kamat and Rozario’s ideal world, similar green spaces will sprout throughout Bangalore. “Our thought is that every new house gives up a little piece of its plot in the form of a green pocket,” Kamat says. “The setbacks form a network and somewhere they bulge out in a little garden, and the whole becomes one system of veins.” That may sound fanciful, but on one lot, at least, Kamat and Rozario have managed to add a welcome dash of green to India’s erstwhile Garden City.